There are decorating trends that take homeowners’ hearts by storm and then quickly fade away, leaving behind an outdated, worn-out look. With white brick, this is certainly not the case. If you do it right, a white brick wall can easily make one of your safest decorating bets that will stand the test of time for both durability and style. Decorating trends come and go, but brick seems to be a long-time mainstay in architecture and home design. What’s the key to its popularity? Well, the reasons are manifold. To start with, brick walls are one of the easiest ways to add flair to an interior, making an irresistible decoration in and of themselves. Another unquestionable merit of brick is its versatility. Brick works well with the majority of popular decorating styles, from Industrial to Boho and Scandinavian. This by far does not mean that brick has no individuality or character, and serves more as a background than a self-sufficient element of decor. In fact, it can do both things, depending on how you work around it. Here’s everything you want to know about white brick walls. how to rock a fabulous white brick wall if real brick is not an option. The aesthetic properties of brick walls, regardless of the color you go for, are beyond discussion. However, white brick seems to be the most versatile and forgiving choice, for more or less the same reasons why it’s best to settle for white paint if you don’t have a knack for experimenting with colors. Of course, a well maintained natural brick wall can be a tremendous style statement, but it needs to be handled with a certain intuition for aesthetic elegance and balance. Red brick is relatively easy to overdo – the fastlane to an overwhelming or gloomy interior that lacks focus and air. In this case, too much of a good thing kills the spirit. You lose that appealing quality of an interior that puts you at ease mentally because it’s so perfectly harmonious. And that quality comes from moderation. White brick also gives us a wider range of options in terms of style. Although red brick may look fabulous in cozy, romantic arrangements as much as in harsh, industrial designs, it does provide a strong, dominant accent to an interior. White brick always enhances the ambience of the room and accentuates its dominant style, but it hardly ever dictates the style itself. It is always up to you whether the wall serves as a quality canvas for your artistic vision or becomes the focal point of your work. White brick gives you almost unlimited freedom of choice in terms of furniture design, color palette and accessories. There is basically no dearth of effects you can achieve when creating your dream arrangement against the backdrop of a white brick wall. Your room can feel idyllic and cozy or cold and ascetic, depending on what decorating style you pursue. White brick can both add warmth and rustic charm to country style homes or accentuate the harshness of ultramodern, minimalist apartments. It can make the room feel bright and airy, or reinforce the power of dark colors by providing stark contrast. Another important argument in favor of white brick is the fact that, compared to natural brick, it can be used in smaller interiors, without making them feel gloomy and cramped. White brick will work even in narrow, poorly lit rooms, which generally need clever design therapy more than any other type of interior. Ultimately, some people say that red brick looks crude and shabby, unlike its white counterpart, but frankly speaking, we don’t take it as a relevant argument. We’ve all seen hundreds of designs incorporating red brick that ooze style and elegance. Besides, beauty lies in the eye of the homeowner. There are no rules in the world of home decor that have been carved in stone, so just go ahead with whatever works for you. That’s the only rule you really SHOULD stick to. As it has been mentioned above, there is really no need to get frustrated about the decorating process and pursue „straight-from-the-magazine” kind of perfection. The trend that is growing in popularity these days pushes aside professionally-designed schemes and turns towards a somewhat laid-back approach to interior design. Your feel for things is enough to help you create a home you love, so don’t be afraid to infuse your own personality into your place. That said, there are some decorating styles that embrace white brick walls with particular ease. And since you landed here, chances are you are on the lookout for tips on how to ”do things right.” Well, the good news is that it’s really hard to go wrong with white brick as it is so universal that it makes a perfect match with whatever decorating theme you fancy. We've seen it paired with austere Scandinavian designs, but also in cosy cottage-style interiors. Just take a peek. White brick and Boho are like pancakes and maple syrup; they’re just meant to go together. Paired with a contrasting mix of soft furnishing and vibrant accessories, white brick becomes a perfect canvas that lends texture to your Bohemian fantasy. If you prefer understated, minimal decor, but still crave that free-spirited boho look, go for neutral palette livened up with natural wood, plants, and gold-tinted accessories. Just follow your own taste! With Boho decor, anything goes. Balancing between hippie and nomad, Bohemian decor creates a universe that combines what’s vintage and homey with a huge dose of cosmopolitan vibe. Macramé wall hangings, ethnic tapestries, dream catchers, souvenirs from your trip to Morocco, wooden bookshelves and succulent plants are all welcome! Exposed brick lies at the heart of the highly saught-after industrial look, celebrating the harsh appeal of raw building materials. And much as red brick will probably never be dethroned in this respect, white brick walls, too, have their well-deserved place in loft-styled arrangements. They make a perfect match with typical components of the industrial style: steel surfaces, glass, weathered wood, concrete, and vintage lighting fixtures. At the same time, they allow for a lighter take on the classical, austere loft aesthetic. Also, they make a perfect background for urban art style wall decor, be it neon lights, graffiti, or bold typography. There’s no need to convince the enthusiasts of Scandinavian decor that white brick is a stunning addition to interior design. Nordic minimalism plays wonderfully with the freshness and unimposing charm of white brick walls, creating a space that looks clean and functional, but at the same time cozy and welcoming. Among the neutral color palettes and elegant lines that are the hallmarks of Scandinavian decor, white brick is no longer a background, but has an equal share in creating the room’s visual impact. The trend for mid-century modern decor may come and go, but the timeless quality of its individual pieces can hardly get boring. Building on a foundation of classic mid-century modern design elements, you can easily update the space for the 21st century. A fabulous white brick wall will give your room a contemporary touch and make the part retro, part futuristic furniture really stand out. Trust us. It’s just one wall, but it makes the world of difference. White brick and farmhouse aesthetic are a match made in decorating heaven. The use of brick, with its simple, romantic vibe, and rustic wood furniture is a great way to draw cues to the countryside theme and living in proximity to nature. As far as the country style goes, the place where brick will look its best is definitely the kitchen – every home’s hub of warmth and coziness. Marked with timeless spirit and strong notes of elegance, colonial decorating is yet another style that seems to be elevated against the backdrop of white brick walls. Colonial decor is somewhat similar to Bohemian style in its international influences. In their colonies around the world, the British mixed many of their interior decorating hallmarks with the local aesthetics, creating a refined blend of insular vibe and English sophistication. A final thought. It’s cool to have a decorating theme, but remember that every home cries out for a bit of individuality. Stick to you favorite theme, but don’t be a slave to trends and try to make your home truly yours by going with your gut feeling and personalizing the space with a generous pinch of whimsy. One thing is beyond discussion – white brick can enhance the look of virtually any space around the house. The only thing you need to do is to curb your desire to „brickify” every single wall in the room (yes, you can overdo white brick, too). A single brick wall, especially one behind the TV, sofa or bed, is your safest bet. Alternatively, two adjacent brick walls will create an impression of a cozy nook – a perfect setting for a sitting or a dining area. Regardless of its simple provenance, white brick is a sleek solution that interior designers and homeowners have gravitated towards for the past few years to add unique character and a touch of sophistication to a space. And nowhere else is this truer than in the living room–the most representative area around the house. The obvious locations are behind the TV or sofa, but it’s just a rule of thumb. If you want to keep it low-key, consider using thin brick veneer around the fireplace. No big deal, you would say, but the outcome can be truly stunning. We’ll never get tired with the use of brick in kitchen decor, whether it’s in the backsplash, stationary kitchen island or any other surface that calls for a dab of texture. The only thing to keep in mind is that kitchen surfaces are prone to spatters and build up of grease. To enjoy a spotless brick wall for long years, without adding to the list of your household chores, consider faux brick panels or ceramic tiles in areas that are most prone to staining. One way to overcome this obstacle, if you want to have a genuine brick backsplash, is to install a glass panel to protect the brickwork. Sleek and practical. We say this every time for every room, but we’ll say it again - white brick is a perfect choice for a bedroom, especially if it shines from behind the bed. Add an interesting headboard and you don’t need to do much more to end up with a stunning retreat. When paired with luxuriant bedding or white canopy, a white brick wall will create a relaxing setting for passion and romance. Brick looks fab in bathrooms, but due to high moisture in your shower and basin areas, it will require some special TLC. To avoid mold issues, either treat your brick wall with a generous coat of sealant or go for ceramic tiles. The latter will put you way ahead in preventing dangerous and unsightly mold growth. Brick wall and nursery – one could think the two are at odds with one another. In fact, white brick is one of the cutest additions to your baby’s bedroom, especially when paired with natural wood and soothing color palettes – a trend that isn’t likely to go away any time soon. An eye-catching entryway sets the tone for the rest of your house, offering a clue to what your guests will discovered upon further exploration. Hallways tend to be the most compact spaces in a home, and if you want to dress them up, you need a solution that attracts attention, but doesn’t make the space seem cramped and stuffy. A white brick will both lend interesting texture to the walls and trick the eye into believing that your entryway is slightly bigger than it really is. One of the ways to keep your creative juices flowing is to arrange an inspiring working space. A picture-perfect home office area set against the background of a white brick wall may well be the solution you are after. And if your eyes get tired of staring at the screen, just raise your head and rest your gaze on a soothing stretch of whiteness. A white brick wall is an appealing decoration in and of itself, so you may well leave it completely blank. This is certainly a good idea if you’re planning to fill the room with interesting furniture designs or saturated, show-offy colors. An unadorned white brick wall will not steal the show, offering a neutral background for other elements of decor to stand out, yet attracting proper amount of attention itself. If your overall decorating scheme is rather toned down in terms of shapes and colors, you may decorate a white brick wall to your liking. If you dream of a full-blown gallery wall, go ahead, but then again, does it make much sense to cover a beautiful brick design with tens of pictures? You tell us. Our top picks are definitely gold framed mirrors, simple bookshelves and vintage wall sconces, which all seem to add to the natural charm of brick. And let’s not forget about large green plants, which always look amazing against the background of brick walls. For those of you who never settle for the ordinary, a large scale graffiti is a growing trend in interior design… no, not only for your teenage kid’s bedroom. Brick has remained a popular building material since the Medieval times thanks to its durability and alluring flair. When done properly, brick walls can add heaps of character to an interior, but they are not free from shortcomings that you should be well aware of before you rip off the plaster to restore brick hidden underneath. Brick walls can turn out to be a real nuisance if the restoration project is executed carelessly, or the building has been taken care of poorly. One of the common difficulties faced by people who decided to expose bricks in external walls is moisture and temperature control. 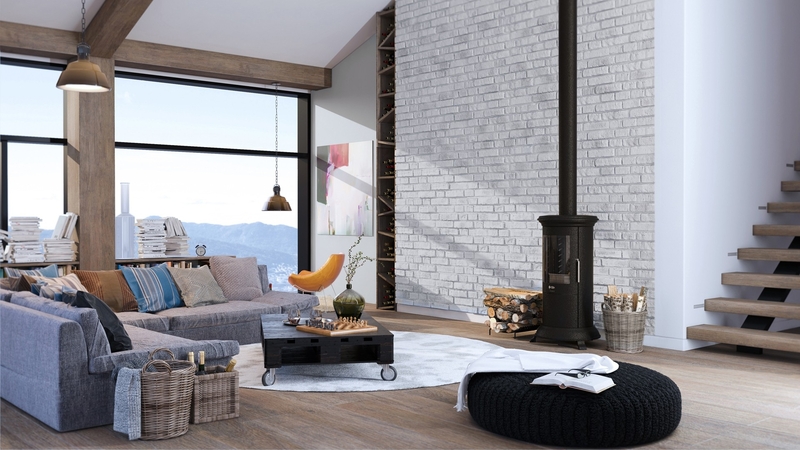 As sturdy as they may look, old brick walls tend to transfer hot and cold air a great deal, which might be a considerable problem in scorching summers and severe winters respectively. Also, if water is absorbed through tiny cracks in the brick structure, mold issues my arise, which is always always an alarming thing due to the potential of mold spores to cause serious health problems. To top it off, it has been reported that temperature and moisture issues may lead to bug colonization. That’s where proper insulation comes in. But even if you safeguard your wall from the outside, there’s another painstaking problem that you will have to deal with — brick dust and crumbling mortar. Old brickwork might need repointing if you want to restore it to its former beauty. What’s more, to prevent health issues and avoid adding to your chores, you should always treat old brick walls with a generous dose of sealant. Once you have completed the above steps, you are ready to paint the wall white, which will eliminate the problem of brick dust Architectural Digest features a compact guide on how to paint brick the right way). But, as with all painted surfaces, its fresh allure won’t last forever, so you will have to repaint the brick once in a while to keep its decorative impact alive. Also, remember that brick structures tend to accumulate dirt and dust over time, so you will have to regularly remove the unsightly buildup to keep the brick wall looking its best. If you crave the look of stylish brick, but don’t feel like getting involved in a demanding restoration project, you’re not left with nothing. There are numerous ways to fake white brick walls or just imitate the look of brick with some cost-efficient interpretations of the trend. If you want to infuse the classic beauty of genuine brick into your home, without adding the mess and costs of exposing old brick hidden under plaster, thin brick veneer is the closest you can get. You can apply it to virtually any interior wall, but this will require certain heavy works, so it does not necessarily make for a happy-go-lucky DIY project. Gypsum tiles are about an inch thick and perfectly emulate the textural quality of real brickwork thanks to their porous surface. They are relatively easy to instal and do not require jointing. The material is resistant to damage and such agents as heat, humidity and UV rays. Want to add amazing texture to your space but keep the look contemporary and light? Choose one of the Scandi-inspired designs of ceramic tiles, with the added value of easy maintenance and stain/humidity resistance, which makes them perfect for bathrooms, kitchens and utility rooms. Self-adhesive faux brick panels equal even less hassle and spending, while looking fab and oh so natural. Check out the Schneiderman’s blog to see how a fairly simple and inexpensive project transformed an outdated store area into an oasis of style and tranquility. If you’re on a shoestring budget and in need of a time-efficient solution, consider faux brick wallpaper. Don’t be afraid that you will end up with a tacky ersatz. They make brick wallpapers seem so realistic today that you can hardly tell the difference unless you come up inches close to the wall. There’s a plethora of designs available, mostly washable and moisture resistant so they can be used in the kitchen, bathroom, or utility room as well. Only sky is the limit to people’s creativity and if you really want to have it your own way, an easy search through the web reveals tens of DIY project ideas on how to fake a white brick wall with cheap and simple means. Just check out this faux brick wall by Craft Passion. It’s made of Styrofoam panels cut into brick-size pieces, which were later spray painted with make-it-stone primer. How about this ingenious project by DIY Design, involving painting tape and interior stucco? Pure magic! And if you’re enthusiastic about working with noisy machines and dig the smell of sawdust, you’ll love this wood-turned-brick project by Daniel from Lowe’s Home Improvement. So much fun!